The D-Day landings on the YELLOW Beaches came as a surprise to the Japanese.2 To the enemy, the extensive swamp along the north coast between the airfields and Borgen Bay seemed an effective barrier to a large-scale amphibious assault. Generals Sakai and Matsuda hoped and prepared for landings aimed directly at Cape Gloucester's beaches, but actually expected the blow to come elsewhere. Instead of hitting these prepared defenses, the Japanese leaders saw the principal Allied thrust being made against Cape Bushing, to be followed by overland and shore-to-shore advance to the airfields. from there to the north coast to join in the fighting. In a week's time, this platoon, too, was ordered into the battle to contain the advancing Marines. In the immediate area of the YELLOW Beaches on D-Day, most of the Japanese troops that tried to stem the Marine advance came from small detachments of the 1st Shipping Engineers and 1st Debarkation Unit. These enemy soldiers, who had operated the supply depot overrun by 2/7, fell back before Combat Team C's assault platoons until they ran into Major Takabe's battalion moving up to launch a counterattack. By late afternoon of 26 December, enough of Takabe's unit had filed down the trail from Nakarop to the area opposite the center of the Marine perimeter to man a strong firing line. Just why the position of 2/7 was chosen as the point of attack is not known, although it is logical to assume that General Matsuda considered this segment of the 1st Division's beachhead would be lightly held. The swamp to the rear of the thin band of Marine foxholes appeared to isolate the defenders from the beach. Darkness veiled the American position before enemy scouts discovered that both flanks of 2/7 were open. The night of D-Day was moonless, and no trace of light penetrated the jungle canopy to reach the men of the 2d Battalion, 7th Marines or the Japanese of the 2d Battalion, 53d Infantry who faced them. Occasionally the adversaries caught a glimpse of the flash of fire at a rifle or machine gun muzzle or the momentary flare when a mortar or artillery shell exploded, but, in the main, the battle was fought by sound. One man, one gun, one group fired and drew a response from the other side aimed at the sound of the firing; then the tempo would pick up sharply and firing would break out all along the front to die away slowly and crop out again at another point. Despite the handicaps of fighting in the pitch-black gloom, Marine fire discipline was good, and Lieutenant Colonel Conoley repeatedly cautioned his company commanders to keep a tight rein on ammunition expenditure. Experience in fighting the Japanese indicated that a headlong assault would be launched at the height of the fire fight. Keeping an adequate reserve of ammunition on 2/7's side of the swamp was a problem handled by the regimental executive officer, Lieutenant Colonel Lewis B. Puller, and his solution for it was carrying parties. LVTs could not be used to haul cargo until daybreak gave the drivers a chance to see the obstacles in their path. In the early evening, files of men from the Regimental Headquarters and Service Company snaked their way through the swamp to Conoley's CP with belted ammunition, bandoliers of rifle clips, and loads of 60mm and 81mm mortar shells. At about 2000, Colonel Frisbie decided to commit Battery D, 1st Special Weapons Battalion as infantry to reinforce 2/7, and Lieutenant Colonel Puller told the battery commander to leave his 37mm guns behind, have each man pick up a load of ammunition at the regimental dump, and then set out across the swamp. Soon after an officer guide from 2/7 met the ammunition-laden column, a violent storm lashed the beachhead area and all trace of landmarks and trail signs vanished in a solid downpour of wind-driven rain. The men of the antitank battery, each holding to the belt of the Marine ahead of him, spent the night struggling to get through the morass and deliver the vital ammunition. It was 0805 before the guide was able to lead Battery D into 2/7's command post. Lieutenant Colonel Conoley immediately sent the reinforcements to his right flank to plug the gap between the 2d and 3d Battalions. The Marines of 2/7 had fought with the Japanese all through the wild night-long storm. The drenching rain filled foxholes and emplacements and forced the men to scramble for cover on top of the ground. Rifles and machine guns fouled by mud and water refused to work, and the fire of battalion and company mortars "layed by guess and by God"8 was invaluable in beating back repeated Japanese attacks. When the storm subsided and daylight began to filter through the tree tops, the tempo of battle increased and the weight of the enemy thrusts shifted west toward 2/7's open right flank. As they arrived at their designated position, the special weapons men of Battery D tangled with the Japanese that had infiltrated the gap between the 7th's battalions. The Marines counterattacked, threw back the enemy troops, and built up a hasty defense line. Company F on the battery's left flank took the brunt of Major Takabe's attack and in a violent, seesaw battle, during which two of its machine guns were lost and recaptured, finally forced the Japanese to withdraw. The estimate of enemy dead in and around the Marine lines was 200-235, but the opportunity to make an accurate count was lost when the action opened anew during the afternoon of 27 December. D was attached to Lieutenant Colonel Williams' command. The center of the perimeter continued to be the focus of enemy attacks, and Colonel Frisbie was able to concentrate what few reserves he had in the area of greatest threat. Wherever the fighting reached a peak, a regimental casual detachment of 30-odd men was committed, then pulled out and used again to meet the next emergency.9 Pioneers from the shore party manned strong points in the rear of 2/7's lines to provide defense in depth. The Japanese did not discover how sparsely manned the perimeter was to either flank and persisted in their attacks on what became its strongest sector. In three days of intermittent but intense fighting, the 7th Marines lost 18 men killed, 58 wounded, and 3 missing in action. Surviving records indicate that in the same period the attacking Japanese suffered at least five times as many casualties and that 2/53 was badly crippled, remaining a battalion in name only. With Combat Team C fully committed just to hold the beachhead it had seized on D-Day, General Rupertus was unable to use 3/7 as he had intended, as a reserve for the 1st Marines advance on the airfields. Neither was Colonel Frisbie in a position to mount an offensive and drive back the Japanese troops attacking his lines. This situation reinforced the opinion that the 1st Division staff had held throughout the latter stages of BACKHANDER planning--the 5th Marines were needed on New Britain. At 2314 on D-Day, Rupertus sent a request to Krueger asking that Combat Team A be sent forward to Cape Gloucester with the advance echelon transported in nine APDs. The request was repeated several times and sent by different means to insure its receipt at ALAMO Force advance headquarters at Cape Cretin. Krueger had agreed to release two battalions of the 5th Marines to Rupertus if the Marine general asked for them after he had landed at the objective.10 At 0751 on 27 December, Krueger sent a liaison officer to Cape Sudest with orders for Combat Team A (less 3/5) to get underway for the YELLOW Beaches. At the same time, the ALAMO Force commander sent a radio dispatch to Admiral Barbey informing him of the decision. Bad weather delayed the plane carrying the messenger and played havoc with radio reception so that Barbey received word too late in the afternoon for the APDs to load Marines of 1/5 and 2/5 and still reach the beachhead by dawn on the 28th. Accordingly, the admiral, who did not wish to expose the loaded transports to the chance of daylight air attack, delayed the whole movement 24 hours. Colonel Selden and his entire combat team stood by all through the morning of 27 December ready to load out. The first troops were already embarked in DUKWs and headed for the APDs offshore when word of the change in orders was passed. On the 28th, while LSTs loaded rear elements of the combat team and all its supplies and equipment, the 1st and 2d Battalions boarded their fast transports and left for the target. At 2100, after a day of hard work, the landing ships followed, setting a course by Cape Cretin to drop off Lieutenant Colonel David S. McDougal's 3d Battalion. While Combat Team A was on route, Rupertus sent Krueger "an earnest plea"11 that no part of the 5th Marines be held back from employment at Cape Gloucester. The Marine general stated that increasing pressure on the perimeter required a landing team reserve in that area, while the remainder of the combat team was used in the airfield attack. Krueger responded almost immediately that he "had no intention to deprive you of its use"12 should the battalion be needed and that 3/5 would be sent forward with the remainder of Combat Team A. On 28 December, while the reinforcements he had requested were loading at Cape Sudest, the 1st Division commander moved his CP to a position behind Combat Team B's front line where he could better direct the advance west. Control of the beachhead defenses was turned over to General Shepherd, whose ADC command group paralleled the organization of the division staff. The 3d Battalion, 5th Marines was slated to report to Shepherd for orders when Combat Team A's LST-borne echelon arrived. With the addition of a sorely-needed maneuver element, the ADC planned an attack toward Borgen Bay to eliminate the Japanese menacing the perimeter. The steady influx of supplies planned for BACKHANDER operations went on without a major hitch while Combat Team C fought to hold the beachhead and Combat Team B drove forward toward the airfields. Through hard, demanding work, Lieutenant Colonel Ballance's shore party was able to overcome the considerable handicap to its operations posed by the limited stretch of dry land between sea and swamp. The LST unloading rate improved considerably after 27 December, when it was no longer necessary to handle two echelons daily. As many as 300 deadweight tons of stores and a full shipload of vehicles were unloaded in under six hours. Ballance's 1,400-man force was able to do its job well despite the fact that the replacement companies and pioneers that made up the bulk of its strength were often committed to hold reserve positions backing up Combat Team C's lines. road used as the axis of advance by the 1st Marines quickly became a quagmire as the result of frequent rain and the damage caused by traffic far heavier than its bed could stand. Moving directly behind the assault troops, Marine engineers with Seabees following close in their trace attempted to keep the supply route in operation. When road maintenance efforts failed, the Army boatmen gave General Rupertus the assurance of adequate supplies he needed to keep the offensive rolling forward. The narrow coastal corridor forced Whaling to confine his attack formation to a column of companies with 3/1's Company I in the lead. A squad of scouts acting as point was followed by a section of three medium tanks, each machine trailed in turn by a rifle squad to give it covering fire in the event of attack. Support to this advance party was furnished by another section of tanks and a rifle platoon which preceded the rest of the 3d Battalion. Peeling off the head of 3/1's column, a succession of small combat patrols took position in the swamp to guard the left flank and then fell in to the rear when the main body had passed. During the day's advance, two belts of enemy defensive positions were overrun and destroyed. When the scouts spotted a pillbox or bunker, they signaled to the tank platoon commander who came forward on foot, located the targets, and then directed the tanks' fire to knock them out. Despite day-long rain that slowed the forward movement, the lack of opposition enabled 3/1 to reach the 4-4 Line, 5,000 yards from the morning's line of departure, by 1350. Division ordered Combat Team B to remain at 4-4 for the night and set up a perimeter defense. The next day's objective was the final phase line designated before the landing to control the advance on the airfield. This 0-0 Line was plotted along a low, grass-covered ridge leading northeast through the jungle to a promontory, soon dubbed Hell's Point by the Marines, which formed one arm of a crescent-shaped beach. Fifth Air Force pilots had located an extensive system of bunkers and trenches in back of this beach with the heaviest concentration on Hell's Point. Although the enemy positions were obviously sited to oppose a landing, they stretched along 300 yards of the long axis of the coastal corridor and promised to be a formidable obstacle if they were defended. permit the reinforcements to get ashore and started into position to exploit any successes won by 1st Marines assault troops. The starting time and span of air and artillery preparations for the attack were adjusted accordingly. General Krueger sent General Rupertus a dispatch explaining the 24-hour delay of Combat Team A as soon as he knew of it, but the message was received in garbled form and could not be decoded until numerous transmissions regarding corrections had passed between the two headquarters.15 Confirmation of the 5th Marines arrival finally came in a message received at 0040 on 29 December. On the 28th, 2/11 culminated a night of harassing and interdiction fire with an hour's heavy shelling of suspected enemy positions immediately to the front of the 4-4 Line. Then at 0900, American A-20s began strafing and bombing targets from the 0-0 Line to the airfields, observing 0-0 as a bomb line beyond which they could attack with no danger to friendly troops. At 1000, when the last of the planes drew off, a further delay in jump-off time was authorized to get additional tanks into position to support the assault. When the order to attack was finally issued at 1100, the 3d Battalion, 1st Marines moved out in the same formation it had used during the previous day's advance. Company I was again at the head of the battalion column, working this time with a fresh platoon of medium tanks. In an effort to broaden the regimental frontage, Colonel Whaling had 1/1 simultaneously start a company through the jungle on the left flank in an attempt to reach the open ground along the 0-0 ridge. The importance of the Marine attack objective was evident to the Japanese, and Colonel Sumiya had no intention of letting it fall without a fight. During the night of 27-28 December, the airfield defense troops who had been held under cover of the jungle on the mountain slopes moved into positions that ran roughly along the 0-0 Line. Waiting for the advancing men of Combat Team B was the major part of the 1st Battalion, 53d Infantry and elements of the Japanese regiment's 75mm gun company. Company A of 1/1, which drew the rugged assignment of cutting through the swamp forest, hit Sumiya's defenses first. At about 1145, the Marine unit reached the edge of an extensive clearing in the jungle about 500 yards from the coast. As the scouts and leading squads started to move through the chest-high kunai grass, a fusillade of rifle, machine gun, and mortar fire broke out from enemy positions hidden in the dense undergrowth across the open ground. Falling back quickly to the cover of the jungle on their own side, the Marines replied in kind, and the grass was whipped by a killing crossfire. It was soon apparent that the Japanese strength was at least equal to Company A's and neither side could gain an advantage. For four hours the fire fight dragged on. The enemy force, mainly from the 1st Company, 53d Infantry, held its ground but could not drive the Marines back. Company A easily beat off two Japanese counterattacks and an attempt to turn its flank. At 1545, the Marines, who were running low on ammunition, began to disengage and pull back to the 1st Battalion's position for the night. Fire from 2/11 covered the withdrawal and discouraged any Japanese attempt to follow. Clearly the task of overcoming the enemy defenses required an attacking force of greater strength. Next morning when this position was found abandoned by advancing Marines, it contained 41 dead enemy soldiers. The cost to Company A of this hard-fought action was 8 men killed and 16 wounded. In a sense, the skirmish in the jungle was a grim side show to the main event, the battle for Hell's Point. This Japanese strongpoint of mutually supporting bunkers and trenches was covered by belts of barbed wire and land mines. Hastily cut gun ports enabled enemy crews to train their weapons along the coastal trail to meet the attack. At least three 75mm regimental guns, a 70mm gun, a 20mm machine cannon, and a dozen or more heavy and light machine guns and mortars were brought into play against the Marines. Steady rain and thick foliage cut visibility to 10-20 yards, and Marine riflemen all too frequently stepped into the fire lanes of enemy bunkers before they spotted the Japanese positions. In this kind of blind fighting, tanks proved invaluable and helped hold down infantry casualties that might have soared had the attack been made without the assistance of armor. The support was mutual, however, and each tank's protective rifle squad kept its sides and rear free from suicide attackers. The fight to capture the beach defense positions was joined about noon when Japanese troops opened fire on the leading platoon of Company I and its spearhead section of tanks. The tanks crushed trenches and bunkers and blasted guns and crews alike, while the infantry shot down the Japanese who tried to flee. When the 75mm guns on two tanks malfunctioned, the advance was halted while tank machine guns poured out covering fire and fresh armor was ordered into the fight. The third platoon of Company A, 1st Tank Battalion, to be committed during the day's action was called up and reached Hell's Point about 1630 in time to destroy the last enemy bunker on the point. It was undefended. Apparently, Colonel Sumiya had ordered a general withdrawal of the survivors of the force which had fought the 1st Marines. Combat Team B was able to occupy the entire defensive position and dig in for the night without any harassment from the Japanese. The night's only excitement was furnished by a false alarm of the approach of enemy tanks, which was countered by positioning two platoons of Marine mediums along possible approach routes with mortars ready to fire illuminating shells to help them locate targets. After the action of 28 December, the Japanese undoubtedly wished they had tanks and plenty of them since their guns proved no match for the American armor. The count of enemy dead reported to division, before darkness stopped the search, was 266.17 In return, the 3d Battalion, 1st Marines suffered casualties of 9 killed and 36 wounded. With the complete reduction of Hell's Point,18 the way was open to the BACKHANDER Force's major objective--the Cape Gloucester airdrome. General Rupertus was present on YELLOW 2 when the first units came ashore, and he got them started toward BLUE Beach to rejoin the rest of the combat team.20 The march was made by truck where possible and by foot whenever the condition of the river of mud called a road demanded. The beachmaster reported the last elements of the 5th Marines on their way west by 0935.
was to be delayed until both the 1st and 5th Marines could join in the advance. General Rupertus and Colonel Pollock reached Whaling's CP shortly after this and outlined the day's operation plan. At 1200, following an air and artillery preparation, Combat Team B, with 1/1 in assault, would drive forward on the right with the coastal road as its axis of advance and Airfield No. 2 as its objective. At the same time on the left flank, Combat Team A, with 2/5 in the lead, would attack through an area in Talawe's foothills believed to contain prepared enemy defensive positions and then strike north toward the airfields. After the attack order was issued, Selden and Whaling went up to the front lines to establish the left flank of the 1st Marines' position along the 0-0 Line. Selden then took his battalion commanders, Major William H. Barba (1/5) and Lieutenant Colonel Lewis W. Walt (2/5), up to the boundary for a brief inspection of the terrain. Deciding to advance with his assault battalion, Selden accompanied Walt when 2/5 moved to its line of departure 1,200 yards inland. Barba's orders called for his battalion to follow the 2d in attack, keeping contact with the tail of Walt's column. On its way to the line of departure, the 2d Battalion, 5th found itself wading through a swamp, one that the regimental commander had been assured contained only a few inches of water. Instead Selden found "the water varying in depth from a few inches to 4 and 5 feet, making it quite hard for some of the youngsters who were not much more than 5 feet in height. "21 The advancing Marines had to move through the swamp and a thick bordering belt of forest in single file, and progress was unexpectedly slow. Before the leading company was in position to move out from the 0-0 Line, division had had to put off the time of attack several times. When 2/5 finally jumped off at 1500, a good part of the battalion was still in the swamp, and Barba's men were just entering. At dusk, the rear elements of 2/5 were clearing the line of departure as the leading units of 1/5 came out of the forest. The terrain forward of Combat Team A's line of departure proved to be much more rugged than it appeared on operation maps. The 2d Battalion column, with Selden and Walt moving close to its head, found the stretches of kunai grass in its path were broken by ridges and bordered by gullies and ravines choked with jungle growth. As 2/5 swung north to move down to Airfield No. 2, it passed through an area of hidden trenches and bunkers all showing signs of recent occupation. There were no enemy troops to be seen. The battalion advanced unchecked and, by 1925, had reached the center of the airstrip and linked up with Combat Team B. The only enemy opposition met on 29 December was encountered by the 1st Battalion, 1st Marines, shortly after it passed through 3/1's positions on the 0-0 Line. A few scattered rifle shots fired at long range by small groups of Japanese troops did nothing to slow the advance. When the open ground along 0-0 was crossed, Lieutenant Colonel Reaves' assault companies moved as skirmishers through 300-400 yards of jungle. 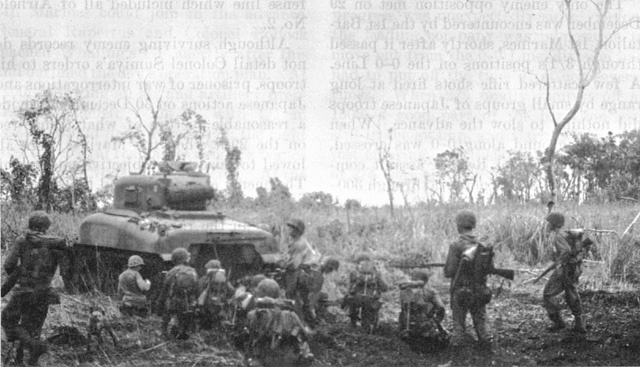 Supporting medium tanks, and half tracks mounting 75mm guns from the Regimental Weapons Company, were forced to stick to the coastal road and kept pace with the infantry while filing around the right flank of the forest barrier. Once they had cleared the trees, the assault troops, tanks, and half tracks joined forces again, ready for a final push to the airfield in sight ahead. Artillery of 2/11 and 4/11 fired on suspected Japanese positions, and two rocket DUKWs of the amphibian engineers which had driven up to the front lines added 50 rounds to the preparation. As if in honor of the occasion, the rain even stopped for a few brief moments. The advance was anticlimactic, and, at 1755, the 1st Battalion, 1st Marines reached the edge of Airfield No. 2. As rain started falling and hastened the approach of darkness, 1/1 hurriedly dug in along a perimeter that looped from the coast inland to the east of the airfield. The 3d Battalion, 1st, which had followed the attacking troops in echelon to the left rear, linked up with 1/1 and extended the perimeter farther around the center of the field. When 2/5 came down out of the hills, the battalion was directed to fill in the remaining segment of the night's defense line which included all of Airfield No. 2. 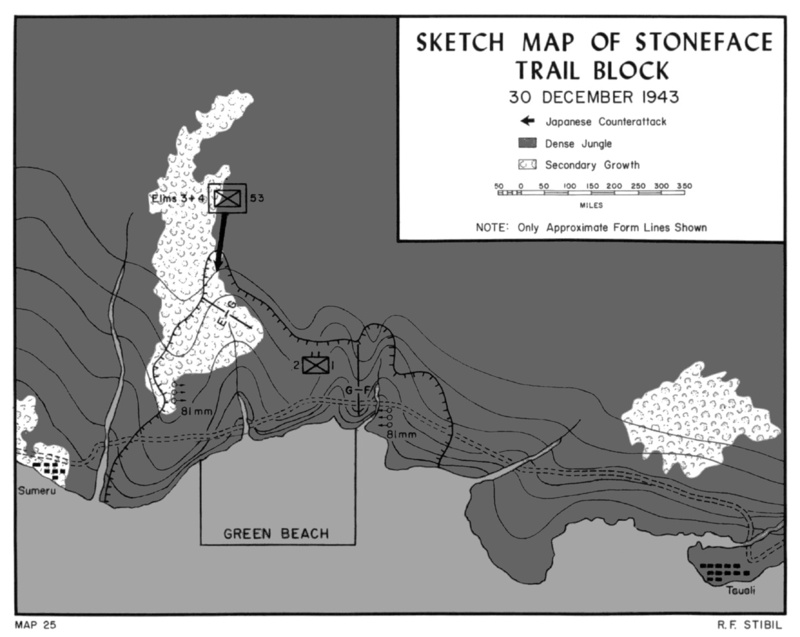 Although surviving enemy records do not detail Colonel Sumiya's orders to his troops, prisoner of war interrogations and Japanese actions on 30 December provide a reasonable picture of what transpired on the 29th when the Marines were allowed to seize their objective unopposed. The enemy commander and the surviving members of his reinforced battalion had hidden in the rain forest that blanketed the hills south of the airfield. Conceding to Marine tanks and infantry the ownership of the low, open ground of the airdrome, Sumiya planned to take advantage of the terrain, his most important defensive asset. 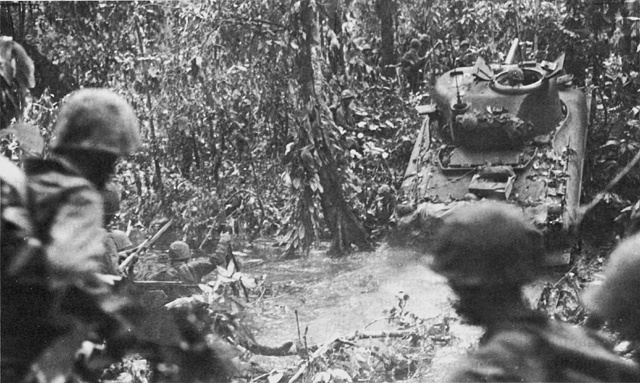 Moving at night, the remnants of the 1st Battalion, 53d Infantry units which had fought at Hell's Point plus at least half of the 2d Company that had not yet been engaged24 occupied the prepared defenses hidden in the dense vegetation on the hillsides and in the cuts that laced the slopes. The most significant feature of the defensive system was Razorback Hill, a high, narrow, north-south ridge with a grass-covered crest that overshadowed both airstrips. To aerial observers and mapmakers, Razorback appeared to be just another kunai patch among many; from the ground it was clearly the key height in the hills bordering the airdrome. perimeter. On the lower portion of Razorback Hill, where the 2d Battalion had passed through abandoned defenses on the 29th, the Marines surprised a group of 12 enemy soldiers just rising from their night's bivouac. The scouts withdrew after an exchange of fire, and a platoon of Company F immediately returned to wipe out what was thought to be a group of stragglers. As the rifle platoon neared the top of a small knob in a kunai field, a heavy outburst of rifle and machine gun fire met it, coming from positions in the edge of the forest ahead. As the Marines sought cover on the hilltop, the Japanese launched a screaming charge up its sides which was bloodily repulsed. When the enemy troops withdrew, the fires of grenade launchers, mortars, and an artillery piece were added to the outpouring from the Razorback defenses. A radio message requesting support brought prompt response, and Marine mortar fire crashed down on the enemy position while the rest of Company F moved up. The Japanese soldiers broke from cover and came racing up the hill in a second attempt to close with the Americans, just as a reinforcing platoon maneuvered to extend the firing line. Heavy fire drove the enemy back into the jungle again and scattered more bodies over the slopes. Tanks were called up and, when the first machine arrived, Company F attacked. Using the tank's gunfire and armor like a crowbar, the Marines split open the first line of the defensive system and drove on through, mopping up the Japanese with grenades and automatic rifle fire. By 1130, the hillside position, which had contained over 30 bunkers, was silent and smoking; its defenders were dead and, in many instances, buried in the ruins of their foxholes, trenches, and emplacements. A count of more than 150 Japanese bodies was reported to division,25 while Company F had lost 13 killed and 19 wounded. The finishing blow to the Japanese defenses was delivered by Lieutenant Colonel Hankins' battalion. Working forward with medium tanks in support, 3/1 located the remainder of the occupied defenses in the area west of the strongpoints encountered by the 5th Marines. Attacking in the early afternoon along a three-company front, Hankins' men drove the enemy out of their positions, forced them to retreat up a ravine leading to Razorback's summit, and followed so close in pursuit that the Japanese had no chance to develop a defense. At a cost of one Marine killed and four wounded, 3/1 overwhelmed the last effective resistance of Colonel Sumiya's force. Artillery forward observers with the attacking troops brought down fire on the fleeing enemy to speed them on their way. A vastly enlarged perimeter, including Razorback Hill in the center and reaching well to the west of Airfield No. 1, marked the Marine position on the night of 30 December. The 1st Battalion, 5th Marines took over a sector of the line between 3/1 and 2/5. During the day's fighting, more supporting elements of both combat teams and of the task force reached the airfield area. On the 31st, after the LST-borne echelon of Combat Team A arrived at the YELLOW Beaches, the assault battalions' heavy gear and the team's light tank company and artillery battalion (5/11) came up. The American force securing the airdrome, basically four infantry battalions, two artillery battalions, and two tank companies, was far stronger than anything General Matsuda could bring against it. At noon on 31 December, General Rupertus raised the American flag over Cape Gloucester to mark officially the capture of the airdrome. At least one unscheduled flag-raising, by Company 1, 3/1 on Razorback Hill,27 preceded this event. Undoubtedly, there were others, for combat Marines have a penchant for hoisting the Colors over hard-won heights. The direct radio link with division that consistently eluded Masters on D-Day could not be made on the 27th either. On the following day, two engineer LCMs with Marine radio jeeps on board were sent north up the coast to get around the communication barrier posed by the mountains. An enemy 75mm gun firing from the Dorf Point vicinity dropped a few rounds near the boats and prompted them to turn back. The coastal voyage proved unnecessary, however, since the battalion's radios "boomed in"33 to division receivers once the landing craft were 200 yards offshore. Starting on the 29th, the LCM-borne radios made contact with the division on a regular daily schedule. The first inkling that the Japanese would probably attack the trail block was discovered on the 28th. An alert Marine on outpost duty spotted two Japanese observers on the ridge opposite 2/1's lines and dropped them both with his rifle. A patrol checked the bodies and found the men, carrying field glasses and maps, were officers who had apparently been reconnoitering the American position. Toward nightfall on 29 December, scattered shots and then a growing volume of sustained fire began to strike the Marine defenses, coming from the jungle inland. A heavy downpour fell steadily, adding to the darkness and deadening the men's sense of hearing as they strained to catch the first sign of the attack that was clearly building. Finally, at 0155, the Japanese charged forward along the one route most likely to let them break through the perimeter--a natural causeway that joined the ridgeline defended by 2/1 and the higher ground inland. fire and stopped in front of the lines. Toward dawn, the Japanese fire slacked until, by 0700, it had died away completely. The cost of this victory to 2/1 and its attached units was 6 men killed and 17 wounded. Mop-up patrols found 89 enemy dead sprawled amongst the Marine positions and in the forest to the front. Five prisoners, all of them dazed and some wounded, were seized. No other wounded Japanese were sighted, and it appeared that the remnants of the attacking force had fled south. The prisoners identified their units as elements of the 3d and 4th Companies of 1/53, and an enemy officer candidate, who surrendered during the day, estimated the attacking strength at 116 men. 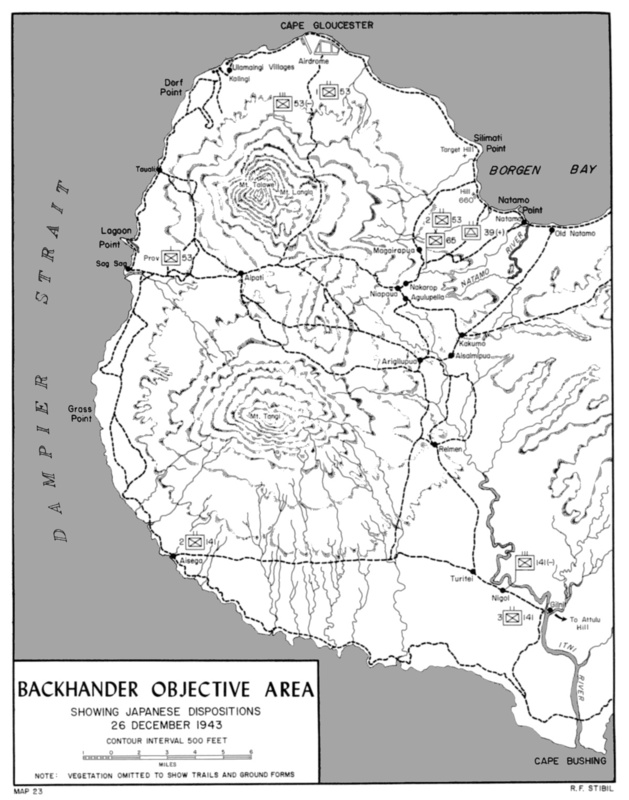 From intelligence gained later in the battle for western New Britain, it appears that the few men who escaped unhurt from the attack on 2/1 were ordered into the fight to contain the Marines driving southeast toward Borgen Bay. On New Year's morning, torpedo boats which had patrolled from Grass Point to Cape Bach during the night took 10 of the most seriously wounded Marines and the enemy prisoners back to New Guinea.34 The ammunition supplies depleted during the fight on the 30th were replenished in an air drop by Fifth Air Force bombers on the 3d. Although almost all signs pointed to a virtual abandonment of the west coast by Japanese troops, Lieutenant Colonel Masters could not chance being caught short. Through the week following the enemy assault, there was scattered opposition to Marine patrols but nothing that indicated the presence of large units. An enemy artillery piece located about 2,500 yards east of the Tauali beachhead began firing ranging shots on the 31st. While the aim of Japanese gunners was atrocious--all of their rounds fell in the sea--Masters wasted no time getting his own artillery in position to reply. Battery H's crews used block and tackle to manhandle their guns to the top of a precipitous bluff that overhung the beach. On the 1st, when the Marine 75s began firing, the enemy gun fell silent. The pack howitzers then furnished support to the patrols that sought the enemy on all sides of the perimeter. In response to an order from division, Masters sent a small detachment to Dorf Point on 2 January to guide Company E of 2/5 into the STONEFACE position for an overnight stay. The 5th Marines' company found no evidence of Japanese in any strength during its march from the airdrome. The enemy troops that had retreated from the airfield defenses seized by Combat Teams A and B had avoided the coastal track and used the trail that led over the eastern shoulder of Mt. Talawe. Under the circumstances, there was no longer any need for the trail block at Tauali, and General Rupertus issued orders for 2/1 to secure and rejoin. YELLOW Beaches and those assigned to the STONEFACE Group shuttled supplies, ammunition, and equipment from the west to the north coast. By the 11th, most of 2/1's bulk stores and heavy gear had been transferred, and the main body of the reinforced battalion marched north toward the airdrome. A small rear-guard working party loaded the last supplies during the early afternoon. At about 1600, when several shots were fired from the jungle south of what had been the Marine lines, the remaining troops embarked. To discourage any venturesome Japanese who might want to fire on the boats as they withdrew, the LCMs sprayed GREEN Beach with machine gun fire as a parting present. The 2d Battalion, 1st Marines rejoined its regiment on the 12th, after spending a wet and thoroughly miserable night in a bivouac area near Airfield No. 1. On 13 January, Masters' battalion occupied positions near the shore within Combat Team B's sector of the airdrome perimeter. With the successful completion of its mission, the STONEFACE Group was dissolved. 1. Unless otherwise noted, the material in this section is derived from: ADC IntelDocuments; ATIS Item No. 9115, MatsudaFor and 141st InfRegt OpOs, 26Dec43-8Jan44, in ATIS Bul No. 721, dtd 14Feb44 (ACSI Recs, FRC Alex); 17th Div Ops. 2. Docu No. 52399, Statement of ex-LtGen Yasushi Sakai in HistDiv, MilIntelSect, GHQ, FEC, Statements of Japanese Officials on WW II, V. III, p. 190 (OCMH). 3. 17th Div Ops, p. 15. 4. ATIS Item No. 9657, MatsudaFor IntelRept No. 3, did 23Dec43, in ATIS Bul No. 788, dtd 11Mar44 (ACSI Recs, FRC Alex); Japanese comments. 5. ATIS Item No. 9657, op. cit. 6. Diary of 2dLt Takashiro Sato, 1st Plat, 6th Co, 141st InfRegt in ADC IntelDocuments. The diary was found in front of the positions of 3/5 during the fighting around Aogiri Ridge. 7. Unless otherwise noted, the material in this section is derived from: ALAMO For G-3 Jnl No. 11; Maj Harry A. Stella memo to ALAMO For G-3, dtd 5Jan44, Subj: Rept of Observer with CT C, in ALAMO G-3 Jnl No. 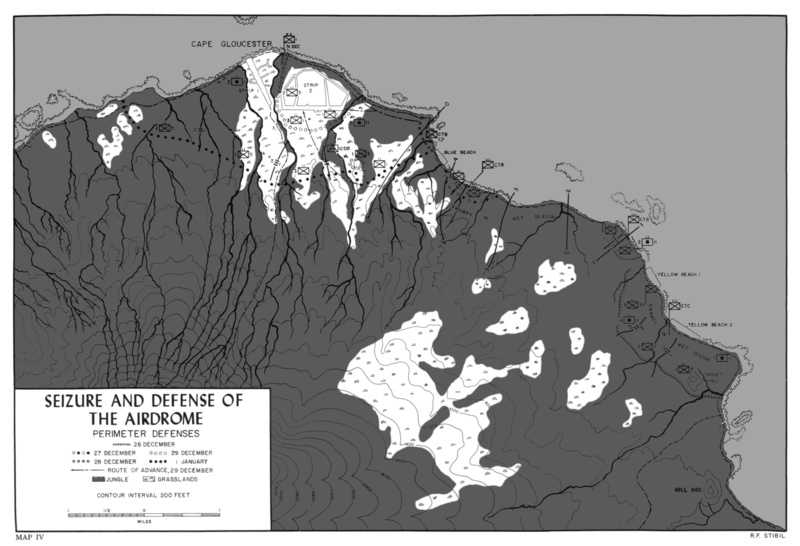 14; 1st MarDiv SAR, Phase II, Part I, YELLOW Beach Landing; 1st MarDiv D-2 Daily Buls Nos. 1-6, dtd 27-31Dec43; 1st MarDiv D-3 Jnl-I; LtCol William J. Dickinson ltr to CMC, dtd 14Mar52; Hough and Crown, New Britain Campaign. 8. Col Odell M. Conoley ltr to CMC, dtd 7Mar52. 9. LtCol Charles S. Nichols, Jr., interviews with HistBr, G-3, HQMC, ca. Jan55. 11. 1st MarDiv D-3 Jnl-I, entry No. 20 of 28Dec43. 12. Ibid., entry No. 20 of 29Dec43. 13. 1st MarDiv SAR, Anx D, Amphibian Tractors, pp. 1-2. 14. Unless otherwise noted, the material in this section is derived from: 1st MarDiv SAR. Phase II, Part I, YELLOW Beach Landing; 1st MarDiv D-3 Jnl-I; LtCol Donald J. Robinson ltr to Dir, HistDiv, HQMC, dtd 7Aug52, enclosing OpLog of Co A, 1st TkBn; Hough and Crown, New Britain Campaign. 15. The last correction needed to enable BACKHANDER Force to break the original message was received at 1133 on 29 December well after Combat Team A's advance echelon had landed. 1st MarDiv G-3 Jnl-I, entry No. 17, dtd 29Dec43. 16. Maj Hoyt C. Duncan, Jr., ltr to CMC, dtd 14Mar52. 17. At least one participant in the day's action questioned this total, and, on the basis of a personal count, estimated the enemy loss at a much lower figure--68-88. Maj William W. Wright ltr to CMC, dtd 15Feb52. 18. General Rupertus later renamed this spot Terzi Point after the commanding officer of Company K, 3/1, who was killed on D-Day--Captain Joseph A. Terzi. 19. Unless otherwise noted, the material in this section is derived from: ALAMO G-3 Jnl Nos. 13-17; 1st MarDiv SAR, Phase II, Part I, YELLOW Beach Landing; 1st MarDiv D-3 Jnl-I; BGen John T. Selden ltr to HistDiv, HQMC, dtd 27Jan51; Hough and Crown, New Britain Campaign. 20. LtCol Charles R. Baker comments on draft of Hough and Crown, New Britain Campaign, ca. Mar52. 21. Selden ltr, op. cit. 22. Col William H. Barba ltr to HistDiv, HQMC, dtd 24Mar51. 23. OCE, GHQ, AFPac, Amphibian Engineers, p. 177. 24. ATIS Item No. 9981, Diary of Cpl Ryotchiro Takano, 2d Co, 1/53, 31Oct-29Dec43, in ATIS Bul No. 808, dtd 14Mar44 (ACSI Recs, FRC Alex). 25. The Commanding Officer, Company F later estimated the dead at a lesser figure, 60 to 70. Maj John B. Doyle, Jr., comments on draft of Hough and Crown, New Britain Campaign, dtd 13Mar52. The battalion commander believed that "a more accurate figure would be about one hundred." BGen Lewis W. Walt ltr to HistBr, G-3, HQMC, dtd 13Jun62, hereafter Walt ltr. 26. Barba ltr, op. cit. 27. LtCol George E. Bowdoin ltr to CMC, dtd 10Mar52. 28. Quoted in 1st MarDiv SAR, Phase II, Part I, p. 13. 29. Quoted in CTF 76 Dec43 WarD, p. 43. 30. 1st MarDiv D-3 Jnl-I, entry No. 9 of 31Dec43. 31. Maj J. B. Bonham memo to Col Eddleman, dtd 4Jan44, in ALAMO G-3 Jnl No. 15. 32. Unless otherwise noted, the material in this section is derived from: 1st MarDiv SAR, Phase II, Part II, GREEN Beach Landing; 1st MarDiv D-3 Jnl-I; CO, Det, 2d ESB Rept to CG, 2d ESB, dtd 20Jan44, Subj: Ops CTF 76 LT 21 (GREEN Beach), in ALAMO G-3 Jnl No. 19; Maj Theodore R. Galysh ltr to CMC, dtd 16Feb52; OCE, GHQ, AFP, Amphibian Engineers; Hough and Crown, New Britain Campaign. 33. LtCol Robert Hall ltr to CMC, dtd 4Mar52. 34. ComMTBRons, SeventhFlt (CTG 70.1) WarD, Dec43, dtd 27Jan44 (COA, NHD), entry of 31Dec43.